Sea Containers House has been transformed into the Mondrian London, a luxury Tom Dixon-designed hotel operated by the Morgans Hotel Group. Tom Dixon-designed hotel in Sea Containers House. London landmark Sea Containers House, situated between the OXO Tower and Blackfriars Bridge on the South Bank, has been transformed into the Mondrian London, a luxury hotel from the Morgans Hotel Group who brought us boutique London hotels the Sanderson and St Martin's Lane. 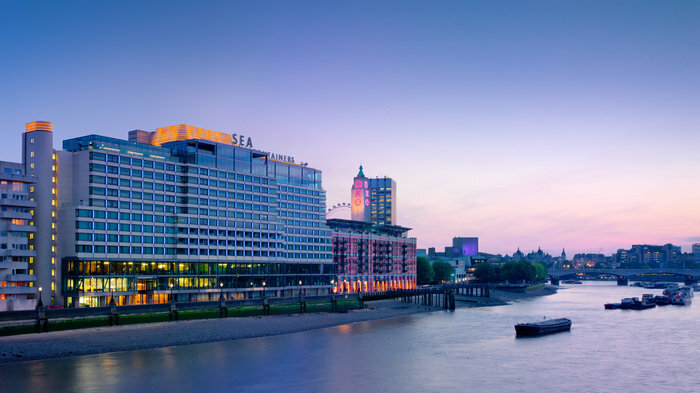 Many of the 359 guest rooms and suites offer stunning river and city views, there's a riverside restaurant and the Dandelyan bar looks across the Thames to St Paul's. The hotel has been designed by Design Research Studio under the creative direction of Tom Dixon who took the Golden Age of transatlantic ship travel as a departure point and ocean liner cabins as his inspiration evident in the copper-clad lobby, curved like a ship's hull. The restaurant is titled after the landmark building's original name. Titled Sea Containers after the landmark building's original name, the restaurant within the Mondrian London combines "the best of England and America" in a restaurant overseen by New York Chef Seamus Mullen, its culinary director. He works alongside executive chef Luke Rayment bringing dishes like slow cooked salmon and lamb rump to the table. There's a beautiful open plan kitchen with a wood-fired grill where grilled pork chop is cooked, then cut into thick slabs and served on a bed of watercress with a "sharp, cidery vinaigrette" (Marina O'Loughlin, The Guardian). "The menu is by no means exorbitant," writes Zoe Williams in The Telegraph, "and by the standard of the fancy interior, is actually good value." "Well worth the stroll from either Tate Modern or the South Bank" says Time Out noting approvingly, "simple ingredients were imaginatively used... in a Middle Eastern-style puree of smoky aubergine". The restaurant has its own bar, but farther along the Thames-side promenade is the more stylish Dandelyan, a proper destination bar. A stylish rooftop bar with beautiful views and beautiful people. Found within Mondrian London - also home to London's hottest new restaurant, Sea Containers - the Rumpus Room is a place to see and be seen. Inspired by 1920s socialites Bright Young Things, the bar revives the raucous era with late-night parties and spectacular views of London's skyline. Sup on champagne and cocktails while you take in the views - both of the river and the pretty young things are sure to be found propping up the bar. Hotel bar referencing the luxurious cruise liners of generations past. A sumptuous, Art Deco-inspired interior designed by Tom Dixon and views over the South Bank, Dandelyan is no unwanted weed. Instead it's a cut above your average hotel hangout with its green marble bar and dramatic views of the Thames. On the ground floor of the Mondrian hotel, tucked away at the rear of the building, Dandelyan references the luxurious cruise liners of generations past. And the feature space at the end of the room - pink sofas and gentleman's club green walls - takes its cues from an original 1978 Warren Platner-designed light that the team found in the building at the start of the project. The drinks menu has been created by award-winning bar impresario Ryan Chetiyawardana, A.K.A Mr Lyan, with innovative cocktails and refined interpretations of the classics, taking the botanical wilds of the British countryside and around the world as inspiration. Six private treatment rooms, including a couples' suite and a private thermal suite, make up agua Bathhouse and Spa within Mondrian London at Sea Containers. Bringing a new concept to the spa, agua is a social place, akin to the Roman spas. Of course you can always indulge in some 'me' time and choose from individual treatments with beauty experts who are well trained and use niche brands like Glamglow, Soveral, and Dr. Jackson's Natural Products, luxury products used by celebrities like Miranda Kerr and Emma Stone. All brands have been carefully selected to tie in with agua's medicinal and sustainable approach. As well as indulgent massage and cleansing facials there's a nail and grooming lounge, separate ladies' and gents' steam rooms with rainshowers, a spa lounge, and fitness centre with state-of-the-art equipment, free weights and cardio workout space. The 56-seat cinema is run by the independent cinema company at weekends. Situated within Mondrian London, Curzon Mondrian is a 56-seat cinema run by the independent cinema company from Friday evenings through to Sunday. Screenings include new releases, classics, matinees and family favourites in a luxury cinema with state-of-the-art projection and sound. From cheap budget accommodation to luxury 5 star suites see our discounts for hotels, including Mandeville Hotel London from 57% off.